Arch pain is felt on the underside of your foot between the heel and ball. The purpose of the arch is to transfer your body weight from heel to toe, and pain is the result when the arch doesn?t function properly. Your foot actually contains two arches: the longitudinal arch which runs the length of your foot, and the transverse arch (also known as the metatarsal arch) which spans the width of your foot. There are 24 bones which create the arches and these bones are held together through their unique interlocking shapes and ligaments. The muscles and the plantar fascia (a broad band of fibrous tissue which runs from the heel to the toes) provide secondary support, and fat pads help to absorb impact and bear your weight. If any of these structures or their interaction are damaged or faulty, arch pain may occur. The most common cause of arch pain is plantar fasciitis, an inflammation of the plantar fascia. You may also suffer arch pain if you have a structural imbalance in your foot or suffer from arthritis. But arch pain may also result from stepping on a rock or when someone steps on your foot. This force may cause an injury such as a bone fracture or damage to the supporting muscles, ligaments, or tendons underneath your foot. There are many different causes of flat feet, which can be separated into two main categories. The first category, congenital flat foot, is a condition that one is born with or is predisposed to at birth. This type includes the completely asymptomatic, pediatric flexible flat foot-by far the most common form of congenital flat foot. Flexible means that an arch is present until weight is put on the foot, at which time the arch disappears. This foot type is a result of the fact that all people are born with different physical features. Some people have bigger noses than others, just as some people have flatter feet (of course, there is no known correlation between the two). Any alteration in the many building blocks of the foot can influence its shape. Treatment must be directed to supporting the individual bones and joints which make up the arch, and to aid the arch in its job as a shock absorber. This in turn alleviates the arch pain, and prevents the further collapse of the arch. This is accomplished through the use of either a high quality arch support or custom-made orthotics. These devices support not only the arch, but each individual bone and joint which makes up the arch; and because of the space-age materials used in their construction, allow the arch to become a much more efficient shock absorber. This not only relieves the arch pain, but also prevents it from returning, and keeps the arch from collapsing further. What Causes Posterior Tibial Tendon Dysfunction ? Overview Flatfoot deformity is a general term used to describe a person whose arches are slowly dropping to the ground, aka ?fallen arches.? Adult-acquired flatfoot deformity can be caused by several factors, but the most common is abnormal functioning of the posterior tibial tendon in the foot and ankle. The posterior tibial tendon is the primary tendon that supports the arch. If this tendon begins to elongate from a sustained, gradual stretch over a long period of time, then the arch will progressively decrease until full collapse of the arch is noted on standing. What makes this tendon elongated? Biomechanical instability of the foot such as over-pronation or an accessory bone at the insertion site of the tendon are the primary causes for posterior tibial tendon dysfunction. Causes Overuse of the posterior tibial tendon is often the cause of PTTD. In fact, the symptoms usually occur after activities that involve the tendon, such as running, walking, hiking, or climbing stairs. Symptoms Posterior tibial tendon insufficiency is divided into stages by most foot and ankle specialists. In stage I, there is pain along the posterior tibial tendon without deformity or collapse of the arch. The patient has the somewhat flat or normal-appearing foot they have always had. In stage II, deformity from the condition has started to occur, resulting in some collapse of the arch, which may or may not be noticeable. The patient may feel it as a weakness in the arch. Many patients initially present in stage II, as the ligament failure can occur at the same time as the tendon failure and therefore deformity can already be occurring as the tendon is becoming symptomatic. In stage III, the deformity has progressed to the extent where the foot becomes fixed (rigid) in its deformed position. Finally, in stage IV, deformity occurs at the ankle in addition to the deformity in the foot. Diagnosis Starting from the knee down, check for any bowing of the tibia. A tibial varum will cause increased medial stress on the foot and ankle. This is essential to consider in surgical planning. Check the gastrocnemius muscle and Achilles complex via a straight and bent knee check for equinus. If the range of motion improves to at least neutral with bent knee testing of the Achilles complex, one may consider a gastrocnemius recession. If the Achilles complex is still tight with bent knee testing, an Achilles lengthening may be necessary. 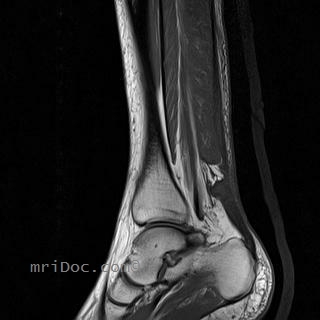 Check the posterior tibial muscle along its entire course. Palpate the muscle and observe the tendon for strength with a plantarflexion and inversion stress test. Check the flexor muscles for strength in order to see if an adequate transfer tendon is available. Check the anterior tibial tendon for size and strength. Non surgical Treatment Non-surgical treatment includes rest and reducing your activity until the pain improves. Orthotics or bracing help support the tendon to reduce its pull along the arch, thus reducing pain. In moderate to severe cases, a below knee cast or walking boot may be needed to allow the tendon to rest completely and heal. Physical therapy is an integral part of the non-surgical treatment regimen to reduce inflammation and pain. Anti-inflammatory medication is often used as well. Many times evaluation of your current shoes is necessary to ensure you are wearing appropriate shoe gear to prevent re-injury. Surgical Treatment Although non-surgical treatments can successfully manage the symptoms, they do not correct the underlying problem. It can require a life-long commitment to wearing the brace during periods of increased pain or activity demands. This will lead a majority of patients to choose surgical correction of the deformity, through Reconstructive Surgery. All of the considerations that were extremely important during the evaluation stage become even more important when creating a surgical plan. Generally, a combination of procedures are utilized in the same setting, to allow full correction of the deformity. Many times, this can be performed as a same-day surgery, without need for an overnight hospital stay. However, one or two day hospital admissions can be utilized to help manage the post-operative pain. Although the recovery process can require a significant investment of time, the subsequent decades of improved function and activity level, as well as decreased pain, leads to a substantial return on your investment. Overview An Achilles tendon rupture is also known as a rupture of the gastrocnemius tendon, or the common calcanean tendon. The tendon is actually composed of 5 different tendons, the two most important being the superficial digital flexor and gastrocnemius tendons. The gastrocnemius tendon is the largest of these, and is the most powerful extensor of the hock (ankle) joint. Both the superficial digital flexor and gastrocnemius tendons attach to the heel bone, called the calcaneus bone. A rupture of the Achilles tendon may be a partial tear, which means just the gastrocnemius is torn, or a complete tear, in which all five tendons have been torn. (show diagrams, normal anatomy vs partial vs complete tears). Causes Common causes of an Achilles tendon rupture include the progression of or the final result of longstanding Achilles tendonitis or an overuse injury. An injury to the ankle or a direct blow to the Achilles tendon. As a result of a fall where an individual lands awkwardly or directly on the ankle. Laceration of the tendon. Weakness of the gastrocnemius or soleus muscles in people with existing Achilles tendonitis places increased stress on the tendon. Steroid use has been linked to tendon weakness. Certain systemic diseases have been associated with tendon weakness. A sudden deceleration or stopping motions that cause an acute traumatic injury of the ankle. Injection of steroids to the involved tendon or the excessive use of steroids has been known to weaken tendons and make them susceptible to rupture. Contraction of the calf muscles while the foot is dorsiflexed (pointed toward the head) and the lower leg is moving forward. Symptoms A classic sign of an Achilles tendon rupture is the feeling of being hit in the Achilles are. There is often a "pop" sound. There may be little pain, but the person can not lift up onto his toes while weight bearing. Diagnosis In diagnosing an Achilles tendon rupture, the foot and ankle surgeon will ask questions about how and when the injury occurred and whether the patient has previously injured the tendon or experienced similar symptoms. The surgeon will examine the foot and ankle, feeling for a defect in the tendon that suggests a tear. Range of motion and muscle strength will be evaluated and compared to the uninjured foot and ankle. If the Achilles tendon is ruptured, the patient will have less strength in pushing down (as on a gas pedal) and will have difficulty rising on the toes. The diagnosis of an Achilles tendon rupture is typically straightforward and can be made through this type of examination. In some cases, however, the surgeon may order an MRI or other advanced imaging tests. Non Surgical Treatment Once the Achilles tendon is partially damaged, one should exercise great care. The risk of rupture is high and if pain is associated with walking, one should consult with an orthopedic surgeon or a sports physician. A complete rupture of the Achilles tendon is never treated at home. It is important to understand that there are no minerals, nutrients, or herbs to treat Achilles tendon injury and any delay just worsens the recovery. Surgical Treatment This injury is often treated surgically. Surgical care adds the risks of surgery, there are for you to view. After the surgery, the cast and aftercare is typically as follows. A below-knee cast (from just below the knee to the tips of the toes) is applied. The initial cast may be applied with your foot positioned in a downward direction to allow the ends of the tendon to lie closer together for initial healing. You may be brought back in 2-3 week intervals until the foot can be positioned at 90 degrees to the leg in the cast. The first 6 weeks in the cast are typically non-weight bearing with crutches or other suitable device to assist with the non-weight bearing requirement. After 6 weeks in the non-removable cast, a removable walking cast is started. The removable walking cast can be removed for therapy, sleeping and bathing. The period in the removable walking cast may need to last for an additional 2-6 weeks. Your doctor will review a home physical therapy program with you (more on this program later) that will typically start not long after your non-removable cast is removed. Your doctor may also refer you for formal physical therapy appointments. Typically, weight bearing exercise activities are kept restricted for at least 4 months or more. Swimming or stationary cycling activities may be allowed sooner. Complete healing may take 12 months or more. Prevention To reduce your chance of developing Achilles tendon problems, follow the following tips. Stretch and strengthen calf muscles. Stretch your calf to the point at which you feel a noticeable pull but not pain. Don't bounce during a stretch. Calf-strengthening exercises can also help the muscle and tendon absorb more force and prevent injury. Vary your exercises. Alternate high-impact sports, such as running, with low-impact sports, such as walking, biking or swimming. Avoid activities that place excessive stress on your Achilles tendons, such as hill running and jumping activities. Choose running surfaces carefully. Avoid or limit running on hard or slippery surfaces. Dress properly for cold-weather training and wear well-fitting athletic shoes with proper cushioning in the heels. Increase training intensity slowly. Achilles tendon injuries commonly occur after abruptly increasing training intensity. Increase the distance, duration and frequency of your training by no more than 10 percent each week. Overview The Achilles tendon is the thickest and strongest tendon in the human body. It plays a very important role in most sport activities and is particularly vulnerable to overloading from repetitive running and jumping. The Achilles tendon forms a joint distal tendon for the gastrocnemius and the soleus muscles. These muscles combine to form the triceps surae muscle. Athletes who sustain Achilles tendon ruptures most frequently are those who participate in ball sports that demand rapid changes of direction and quick, reactive jumps (e.g., tennis, squash, badminton, and soccer), in addition to runners and jumpers in track and field. Sometimes a patient with a ruptured tendon has a history of long-term pain localized to the tendon, but more often the rupture occurs without warning. Such ruptures are often caused by degenerative changes in the tendon (tendinosis), usually in the segment of the tendon that has the worst blood supply. This segment extends from 2 to 6 cm proximal to the insertion of the tendon onto the calcaneus. 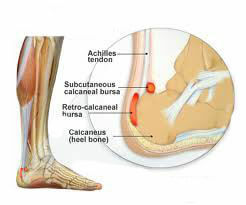 Causes Achilles tendon rupture occurs in people that engage in strenuous activity, who are usually sedentary and have weakened tendons, or in people who have had previous chronic injury to their Achilles tendons. Previous injury to the tendon can be caused by overuse, improper stretching habits, worn-out or improperly fitting shoes, or poor biomechanics (flat-feet). The risk of tendon rupture is also increased with the use of quinolone antibiotics (e.g. ciprofloxacin, Levaquin). Symptoms Patients who suffer an acute rupture of the Achilles tendon often report hearing a "pop" or "snap." Patients usually have severe pain the back of the lower leg near the heel. This may or may not be accompanied by swelling. Additionally, because the function of the Achilles tendon is to enable plantarflexion (bending the foot downward), patients often have difficulty walking or standing up on their toes. Diagnosis Your doctor will ask you about your symptoms and examine you. He or she may also ask you about your medical history. Your doctor may ask you to do a series of movements or exercises to see how well you can move your lower leg. He or she may also examine your leg, heel and ankle and may squeeze your calf muscle to check the movement of your foot. You may need to have further tests to confirm if your tendon is torn, which may include the following. An ultrasound scan. This uses sound waves to produce an image of the inside of your leg. An MRI scan. This uses magnets and radio waves to produce images of the inside of your leg. Non Surgical Treatment Non-surgical treatment of Achilles tendon rupture is usually reserved for patients who are relatively sedentary or may be at higher risk for complications with surgical intervention (due to other associated medical problems). This involves a period of immobilization, followed by range of motion and strengthening exercises; unfortunately, it is associated with a higher risk of re-rupture of the tendon, and possibly a less optimal functional outcome. Surgical Treatment Surgery may be indicated directly following injury rather than conservative care. Repair of an achilles tendon rupture is greatly varied for each clinical situation. There may be a direct repair of the ends of the tendon with suture, or possibly a tendon graft used to augment the tendon. Post-operatively, the period of immobilization will depend on the size of the defect that was repaired and how it was completed. Usually the immobilization is between 6-10 weeks. This repair may allow for a complete return to normal function, but in many instances the healing is complicated with adhesions and a partial loss of range of motion. There may be a continued soft tissue defect noted and a permanent or prolonged swelling. Prevention To prevent Achilles tendonitis or rupture, the following tips are recommended. Avoid activities that place an enormous stress on the heel (for example, uphill running or excessive jumping). Stop all activity if there is pain at the back of the heel. If pain resumes with one particular exercise, another exercise should be selected. Wear proper shoes. Gradually strengthen calf muscles with sit-ups if prior episodes of Achilles tendonitis have occurred. Always warm up with stretching exercises before any activity. Avoid high-impact sports if prior episodes of Achilles tendon injury. Orthotics. Interpod orthotics re-align and support the foot; therefore reducing any excessive stress when walking or during activity. Orthotics can assist with maintaining arch profile and allow for more effective functioning of joints. Footwear. A strong supportive, well fitted shoe may assist with reducing excessive pronation and support the joints of your feet. A supportive shoe will also help maximise the function of your Interpod orthotic. Padding may be applied to your shoes or feet by your practitioner to reduce excessive stress. Specific taping techniques can be applied by your practitioner to improve foot function. Your practitioner may advise certain stretches or exercises to assist with maintaining foot function and reduce painful symptoms. Pain medication such as NSAIDs (ibuprofen) may be advised by your practitioner. If all conservative options have been exhausted, then surgical correction of flat feet may be undertaken.